Warning: file_put_contents(sites/rit.edu/files/php/twig/5cbd8e9c1b613_image-formatter.html.twig_Y7hawJAFpjxvpRyARJ20VB68F/.htaccess): failed to open stream: Permission denied in Drupal\Component\PhpStorage\FileStorage->ensureDirectory() (line 123 of core/lib/Drupal/Component/PhpStorage/FileStorage.php). Gaia is almost entirely run by RIT students and alumni. Pictured here are James McGee, left; Kerri Zalba, center left; Brent Chase '17, center right; and Joseph Clifford '17, right. James McGee and Kerri Zalba are two members of a student start-up company called Gaia. 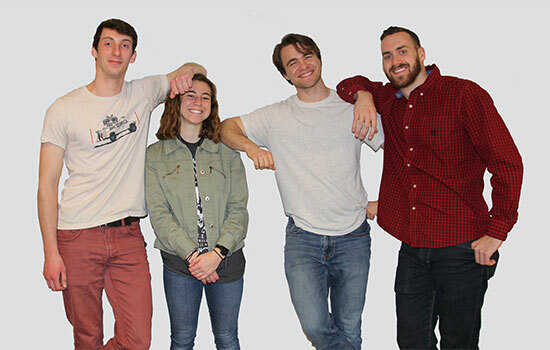 Co-founded by Brent Chase ’17 (biomedical engineering), Joseph Clifford ’17 (mechanical engineering) and Liam Herlihy ’17 (electrical engineering), Gaia’s aim is to “help prevent, mitigate or decrease the frequency of meltdowns for children with autism” by utilizing wearable technology to detect these intense responses to overwhelming situations before they occur. McGee, a fifth-year biomedical engineering major from Hammonton, N.J., and Zalba, a second-year software engineering student from Cleveland, are both passionate about helping people through this technology. Both have some experience interacting with the autism spectrum disorder community and want to help make identifying possible triggers and avoiding meltdowns easier for parents, caregivers and others who work with children on the autism spectrum. Last month, the Gaia team was invited to present their business pitch at the South by Southwest Student Startup Madness competition. The business was also featured in a “Coolest College Startups of 2018” article published by Inc.
Chase, a co-founder and CEO of Gaia, was inspired to create this technology by his little brother, Alec, who was diagnosed with autism spectrum disorder. He grew up seeing how a normal activity could turn into “complete agony at the mere sight of one of his triggers,” and wished he could stop the meltdown before it began. In search of a solution to help his brother and other individuals with autism spectrum disorder, Chase created Gaia. Starting as a project in his senior design class, Chase has now expanded his team to include 15 other students from RIT and Northwestern University and has contracted a multidisciplinary senior design team from RIT to help Gaia with machine learning development and engineering test prototypes of the product. Question: Why did you choose to get involved with Brent Chase and his company Gaia? McGee: So, originally, I got involved with Gaia when Brent was doing it as part of his senior design class at RIT. In the summer of 2017, I needed a co-op to fulfill my school requirements and I was able to start working with Brent for something to do that would fulfill the requirement. After working with him all summer, I started to see that we had made a good deal of progress and that made me want to stay involved. Q: What is it like working for a student start-up? Zalba: It’s definitely interesting because you have to figure things out along the way. There is not a lot of big direction, it’s mostly just working on what we are able to do now based on the research we have done at the time. We are all students as well and we do have our school commitments, so it’s a little crazy balancing everything. It’s pretty hectic, but it’s also a lot of fun being involved with this. I’m able to apply things that I’m learning in school to an actual real-world project and being able to do this while I’m still in school is really cool. A lot of the stuff that I do on the software side is stuff that I’m learning in classes so it all flows really nicely and I’m able to see how the concepts I’m learning are integrated into actual practice. Q: How does this wearable technology work? McGee: Basically, the whole idea of the product is to utilize smart apparel technology, similar to a Fitbit, to collect data from the human body. We have an algorithm that Kerri and a couple other team members developed that takes this information and creates an emotional profile for the individual wearing the smart apparel. So the ability to sense and monitor that information coupled with a mobile or web application that we are currently working on can be used as a way to detect or predict meltdowns in an individual with autism. With the information our technology collects, we might be able to send a warning to a parent, teacher or caretaker so they can, ideally, mitigate or avoid a meltdown. Q: Why do you feel having this technology is important? McGee: My experience with autism spectrum community is a little different. I don’t personally have any family or close friends with autism spectrum disorder, but I worked at a summer camp for a couple of years and we had a handful of kids that were on the spectrum. A lot of times there was a communication barrier and disconnect between the staff and the child, as well as between the staff and the parents. I once saw a kid absolutely lose it because he saw a bee and he wasn’t able to do anything for 45 minutes. We were just sitting there and we didn’t really know what to do. It was pretty obvious to me that something could be improved and something could be done better. Now, through this project, I genuinely think situations like this could be helped and that the communication gap can be bridged, which is awesome. We can help a lot of people with this technology. Q: What has it been like seeing the business begin to gain more traction and publicity? Zalba: It’s totally awesome. It’s unreal. I’m only a second-year and I haven’t even had my first co-op yet. I think it’s so cool to get our product out there and get some good publicity and PR to help promote our product. The ultimate goal, that I think all of us can agree on, is that we want to help people. So if we can get word out there so people can see that what we are doing can help people, that will help us meet our goal. It’s so amazing that people are recognizing our product as something really cool and something that is a form of next-level technology. Q: How do you see this business expanding in the future? McGee: I think that talking to a lot of people within the autism spectrum disorder community is key, from individuals to parents to teachers to occupational therapists and anyone else who works within the community. The market size and the number of people who could potentially be interested in our product is definitely there, so we can be pretty optimistic in our growth. Throughout this process, we also found that there is potential to use this same technology for other applications as well. Ultimately, we all just want to continue making the best product we can to help people. Gaia is a company almost completely run by RIT alumni and students. Other team members from RIT include: Caitlyn Daly, a second-year web and mobile computing major; Dean Kourouspas, a fourth-year computer engineering major; Hammad Ahsan, a fourth-year computer engineering major; Erin Butler, a second-year biomedical engineering major; Christopher Flemming, a fourth-year industrial design major; Sophie Becker, a second-year industrial design major; and Abagail Bleakney ’17 (industrial design). Gaia team members from Northwestern University are: Christian Luciano, a second-year computer science major; Yakira Mirabito, a fourth-year materials engineering major; Ross Blackwell, a fourth-year design engineering major; and Annie Sawyer, a fourth-year biomedical engineering major. More information about the rest of the team, their product and their progress as a student start-up is available on their Facebook page.